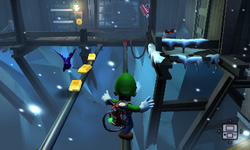 The Workshop Landing is an outdoor area of the Secret Mine in Luigi's Mansion: Dark Moon. The Workshop Landing is accessed by taking the High Wires. The Workshop Landing is a small area with narrow beams. There is a small piece of flooring with two doors and a Pixelator camera nearby. The door on the north leads to the Workshop and the door to the right leads to the Maintenance Room. In Across the Chasm, Luigi has to cross the rails in the Workshop Landing and enter the Maintenance Room to reactivate power to the area. If Luigi looks through the Workshop window in this mission, the Shrewd Possessor eventually notices Luigi and scares him away. In Chilly Ride, Luigi is automatically pixelated to the Workshop Landing. Luigi must use the Strobulb on the door to the Workshop so he can fight the Shrewd Possessor.